Ridgefield resident Cathy Jumper celebrated 1,000 rides with us earlier this year. An avid exerciser, Cathy has to have her Joy! Last summer, she amazed friends and family by transporting a JoyBike to her vacation on Cape Cod. She shares how she became a JoyAddict, partly because of the “Cheers”-like environment she has grown to love. 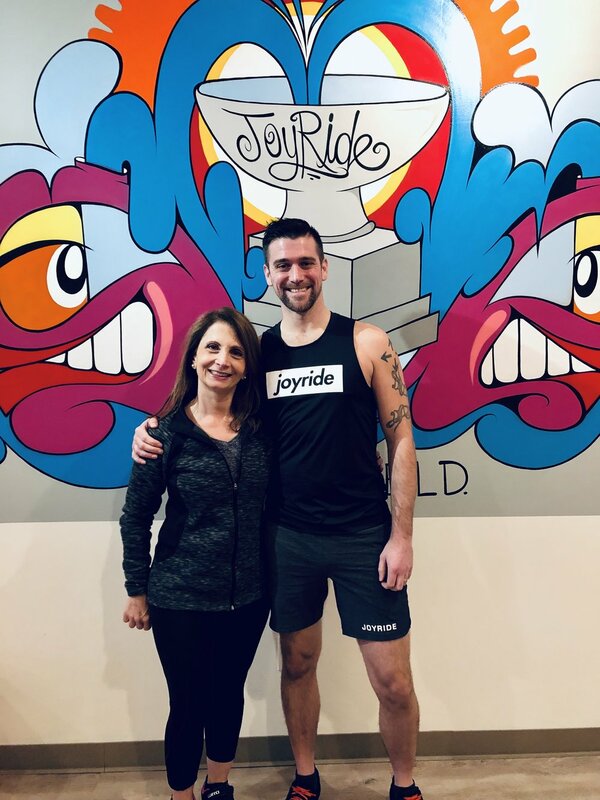 Cathy is pictured here with Jared Marinelli, the first JoyRide instructor she rode with five years ago, and explains how JoyRide made her feel at home right from the start. Special “cheers" to Cathy for 1,000+ rides and being a vital part of our Ridgefield and Wilton studios! What initially brought you to JoyRide? I heard of a new fitness studio opening up. I had always been active, but had never done indoor cycling before. When the studio opened, I did a few of the Community (free) classes. Before I knew it, I was hooked and I bought my first 10-pack. Has exercise been a part of your life for a long time? Absolutely — I have always been involved in fitness, whether it be at a local gym, or in my home. Curves, New Woman, Susan Marlow, aerobic step classes, yoga, P90X - you name it, I’ve tried it! JoyRide has become a place where I have found a sense of camaraderie, confidence, friendship, encouragement, and success. I look forward to my workout each day. JoyRidgefield has gone through many changes since they’ve opened, but the core of the dynamics has remained the same. Whether it’s the person you talk to while putting your spin shoes on, whoever’s behind the desk, the rider you sit next to regularly, the instructor after class or the chatter in the lobby when you’ve finished your ride-that’s all helped me to find my place and belonging at JoyRide. It’s hard not to feel like you belong in such a welcoming environment. I spin 6-7 times a week and try to get in 3-4 circuit/sculpt classes. Between the classes offered at JoyRidgefield and JoyWilton, I’ve found a routine that fits my needs. How would you describe the JoyRide experience to friends and family? The JoyRide experience is fun, motivating and challenging. It’s hard not to feel like you belong in such a welcoming environment. What are/were goals that you wish to accomplish with the help of JoyRide or that you already accomplished? When I first started, I just wanted to be able to keep up and reach my 100th ride. Almost five years later, I am a stronger and more confident rider. Reaching my 1000th ride was a big accomplishment. Moving forward, I hope to be an inspiration to other riders and to continue to “enjoy the ride."